Mood: Tomorrow is our 12 weeks’ scan, and I feel like our 8-week scan was ages ago, when it was only about 4 weeks. I’m feeling worse than I have felt in ages, I feel anxious and I can’t seem to pin point why. I know that I am feeling more depressed, but that is more down to the fact I feel like such a rubbish mama to Emily. I am really struggling to do the simplest of things, such as get up in the morning. You’d be surprised just how draining it can be being sick. I am really concerned about Christmas though, as I don’t want to spoil the day with Emily. So far, on the run up to Christmas I have managed to do nothing. I feel like an absolutely awful mother to Emily, I forgot to buy her an advent calendar – cue everyone else buying her one and now she has four. Daddy, Auntie Toni, Grandad Bill, and Grandma all brought her one. I was so relieved as I really didn’t want her to miss out, although luckily, she is still quite young and wouldn’t notice that she doesn’t have one. I also have Christmas day to get through, which again is going to be so difficult. At the moment, I can’t eat any hot food, the thought of it makes me sick to my stomach and the smell alone is enough to make me physically sick. Sam’s nan kindly invited us for dinner at her house for Christmas day, and I so hope that I can get through the day without being sick. It also takes a weight off my mind, as I was so worried about cooking Christmas dinner. I can barely make a sandwich let alone cook a Christmas dinner. Symptoms: Where do I start? The hyperemesis Gravadirum is awful, I am being sick roughly 10-15 times a day, and that Is with the sickness medication. I also keep having dizzy/faint spells apparently, it is normal symptom when you suffer with HG. I must of course be careful that I don’t get dehydrated again – I really don’t want to end up back in hospital. We saw the midwife today, she was nice enough to come to the house to do my book in, I have really been struggling to get out of the house. The HG prevents me going out because I am too scared that I will end up being sick somewhere where I can’t get to a toilet or bush. I know it sounds silly but I would be so embarrassed and it would be a huge trigger for my anxiety. The midwifes name is Carol, she is lovely, and I must admit I was relieved that I had a different midwife to the one I had with Emily. The previous one was horrible to me and didn’t support me when I needed it most (you can read about that in my bump updates from my pregnancy with Emily). We went through all the paperwork that was necessary, she also referred me to a service called FACES, who should be able to help give me support with my depression. She also wants to make a plan of action encase I sink back into depression again. I feel relieved that there will be some kind of plan in place, but I am really hoping I won’t need it. I’m sure that I will experience some kind of depression as it isn’t completely gone and it never really does, but I hope that I don’t get antenatal depression again, as I struggled with that more than the PND. Again, that could be due to the fact I had little to no support from any medical professionals. Overall I just feel thankful that I have support this time, and a midwife who understands. Sleep: Sleep isn’t an issue at the moment, by 6pm I’m ready for bed or falling asleep on the sofa. One of the side effects of my sickness medication is extreme tiredness, so taking three of those a day completely wipes me out. Food Cravings: Nothing – every kind of food just makes me sick, and I must admit I am getting a little scared of eating as I am always scared I’m going to be sick again. 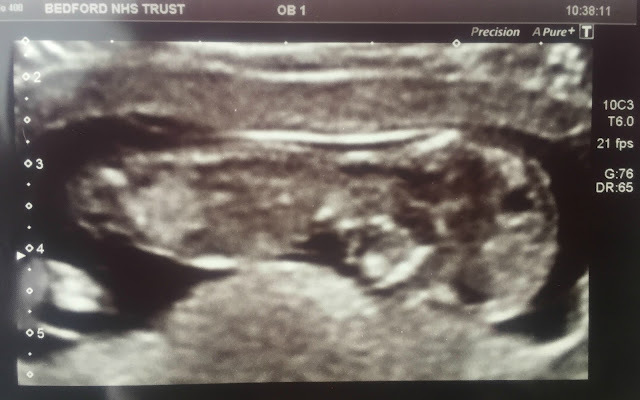 Highlight of the week: Our 12-week scan! We decided that we would bring someone with us to watch Emily in the waiting room while we have our 12-week scan. Apparently, you are not allowed to take children into the scan with you, although Emily went into both of our previous scans. I has made me a little sad that she cannot come in with us, as I know that she would love seeing the baby on the screen. It does make me even more determined to book a private scan – more for reassurance, but also so Emily can be part of the whole thing. The lady who did our scan wasn’t very talkative, I always feel more anxious when they don’t speak. I also feel like we were rushed in and out so fast! Baby E looks good though, growing well, and all the checks were perfect. We were given our due date, which made it feel a little more real. I still can’t seem to get my head around the fact we are having another baby. I am sure once we find out the gender I will feel a little better, just like I did with Emily but at the moment I just feel ill. It is so strange when you know you’re pregnant, you can see the baby on the screen, but for some reason you just don’t feel like you are. Sam was so happy to see our baby, the best part about our scan (aside from knowing that the baby is ok) was the look on his face. I know that my sickness has been hard on him too, and I have not been the easiest person to live with, even if he is to kind to admit it. I’m not sure when we will tell family, I still don’t feel like I am ready for anyone to know. 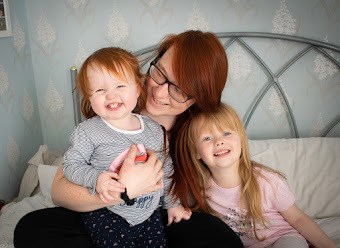 I think because I am so poorly I just want to get through it and make sure that baby E carries on growing and developing the way they are supposed to. Especially as I am still losing such a lot of weight. We also brought a extra copy of the scan photograph for Emily. It is so important to me that she feels like she is included in this pregnancy. I know that she is excited as she always tells me and her daddy that there is a baby in my tummy. She will also randomly come up to me and give my tummy a kiss, which is very sweet. Since we gave her the scan picture she has been content on taking it everywhere with her, she even fell asleep holding it, when Sam tried to take it out of her hands she opened her eyes, pulled it away from him and went back to sleep. It was honestly the cutest thing. Baby Development: Week 12 - Fully formed from top to toe, the baby's development has now passed its critical stage.